Sometimes we are lucky enough to get to photograph Weddings in places other than Sheffield, this was one of those occasions. This Wedding was in Lastingham, North Yorkshire at the beautiful St. Mary's church. This image was captured on the moors above the village in a half hour session with our Bride and Groom between the Wedding Ceremony and the drinks reception in the village hall. This location is very special to this couple as it was here that the Groom to be proposed to his then girlfriend. 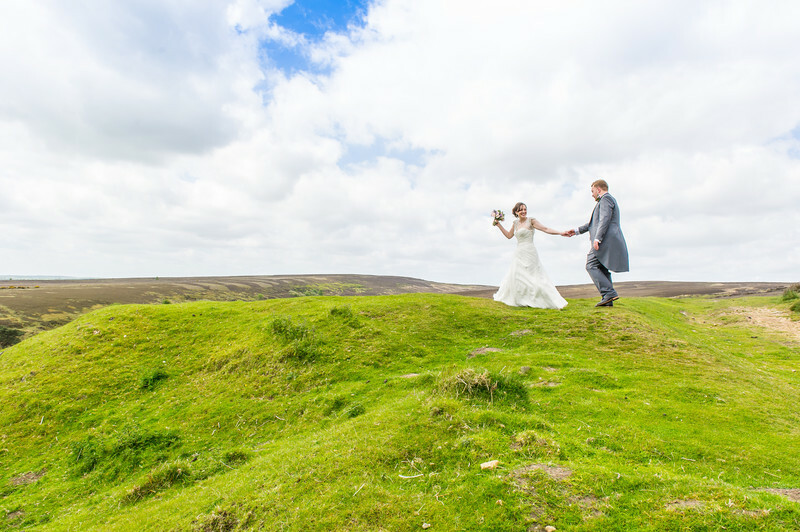 It is an amazing place for Wedding photography or any other sort of photography for that matter, the moors stretch on for miles and on a day like this in early summer the scenery comes to life. Following taking these pictures we moved back to the village hall for some drinks and a snack before the complete Wedding Party travelled back to the Forest and Vale Hotel in Pickering for the rest of the days celebrations which went on for the complete weekend and beyond. This image is one of my all time favourites. I loved the excitement of creating it with the newly married couple alone in the landscape with not a sign of anyone else around, a stunning location wit a lovely couple. 1/400; f/8.0; ISO 320; 24.0 mm.